After reading and listening to the Old Testament Minor Prophet of Malachi several times this week, one thing that this book, the final words of the Old Testament, says to me is, “If you say you are going to do something, then do it!” If you make marriage vows, then keep them. Do not cheat on your wife or husband, and do not get divorced. If you make a promise to God or have a covenant with Him, then keep your promise, as you know that God is going to keep up His end of the deal. If you say you are going to pay someone for work, then you pay them. If you tell God that you are going to offer Him a sacrifice, then do it! If you tell Him that you are going to sacrifice the best of your flock, then sacrifice your very best, not the leftover animals that you have no use for. Basically just keep your word, your promises and your commitments, both to God and to other people. When Malachi calls out priests for offering lame, blind and diseased animals to God, he makes a strong point. These words make me think about whether we truly give God our very best or not. Since I have never been part of a church that makes animal sacrifices to God, and because I am not a farmer or a rancher, it is hard for me to relate to the whole animal sacrifice thing. However, I do think there is still value in this message, even in today’s world. These words make me consider how we are too often guilty of giving God our leftovers instead of our very best. In today’s culture if you are not busy all the time then you are abnormal. Satan is sneaky, smart and creative in the ways that he tries to pull us away from God, and I honestly believe that Satan can use good things in our lives to make us too busy for God. If you are a parent then you can relate to this with your own list of events, but for my family right now our schedule is so incredibly hectic. Will is playing on a travel basketball team, and the last couple weeks he had basketball games or practices on Monday, Tuesday, Wednesday and Thursday. We also have Monday children’s choir, Wednesday night church, Julie Beth’s gymnastics, school everyday, Sunday church, etc. Jennifer and I have work, and I have a few things I help with at church. Plus we both run or workout everyday. It is pretty much always like this, but the activities change based on the season. Will finishes basketball in 2 weeks, and the very same week he starts practicing with his travel soccer team. Everything I just listed is good on its own, but the cumulative effect can be exhausting. When time is short, something has to give, and it is too common for personal and family time with God to be what gets the leftover time (or no time at all). Should God not get our time first before we give it away to so many other tasks? Here are some ways I have been battling this in recent weeks. Personally I have made this commitment to read the entire Bible one book at a time and to write my thoughts on each book. That is why I am writing right now. I do have to make time for the writing part, but to hear God’s word I simply listen to the AudioBible while I work on eBay and work around the house. The kids and I have started listening to The Jesus Storybook Bible audio cd in the car as we drive home from school and basketball. This is helping us get into God’s word more even while we still remain busy with other things. We simply sacrifice a little Netflix and music time to listen to the Bible instead. I think this can be related well to the animal sacrifices in Malachi. How do we spend our money? Do we tithe and give our money to God’s work before we spend it on ourselves? Do we only give to church and to others in need after we have first bought everything we need AND want? Jennifer and I started tithing faithfully about 7 or 8 years ago, and while we have never made a ton of money, we feel that sacrifice every week. When money gets tight it is tempting to stop tithing, but we always remember that while we may not have everything we want, God has always provided everything we need. We have always been prayerful about our finances, and God has always given us enough to pay all our bills. It is easy to stress over money, especially at times when we were crippled by debt, but we have learned that the only way to truly be confident that we will always have enough money is to trust God with it. Part of that is first giving money back to God. 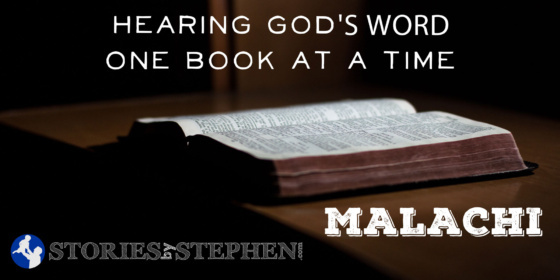 Malachi offers strong words about tithing. Malachi does not specifically talk about using our talents for God’s work, but all the talk about giving money and animal sacrifices to God first before we take for ourselves makes me think of the way that we use the talents and abilities that God gives each of us. You are talented. You may not be a professional athlete or famous entertainer, but you are talented at something. Your talent might be balancing a budget, or it may be building houses. Maybe you have a natural gift for organization or managing people. Some seem to be great at everything they do, but everyone has at least is good at something. I have never met a person that did not have any natural, God-given talents. So what are you doing with those talents and gifts? Do you use them for personal gain? Do you use them at all or keep them buried away? Do you use them to help your church and your local community? Obviously there is nothing wrong with using your talents to make money. Wouldn’t you rather have a job where you get to use your talents than to have a job that you hate? God designed each of us with purpose, and if we are wasting our talents, then I believe we are not fully living by God’s design for our lives. Even if you don’t use all your talents at your job, you can use all your talents to serve God. I have heard countless talented singers and musicians that never have a career in music, but if God has given you the gift of music, then use it for the church! Join the choir or the praise band, or even just sing or play guitar with preschoolers. Sing praises with your kids. Help lead worship at church camp or on a mission trip. Get involved with a prison ministry and sing for prisoners. I could go on and on with ways that musically gifted Christians could use their talents for God, and it is the same way for all of us who have other talents. I am not a gifted singer, but I am good with technology. So I run the Media Shout slideshows for the worship team at church. I can build websites and write, so here I am with this website. I have other talents that I try to use to serve and glorify God, although I often fall short. I am simply saying that it would be great for all of us to take a little time and consider the talents that God has given us and pray for God to give us opportunities to use them for His purposes. Here are a few more key themes that I keep hearing over and over again in Malachi: honor, respect, faithfulness, justice and loyalty. Honor God. Honor your commitments. Honor your marriage. Honor any covenants you have made. Honor your father. Honor your master. It dishonors God when we offer Him sacrifices that are cheap or weak. Do not give God your leftovers or that which is worthless, but give God your very best. Respect your parents, your leaders, your masters, your boss, etc. Respect those that you teach and those that your lead or govern. Be faithful to God. Be faithful to your marriage. Do not cheat on your spouse, and do not divorce each other. Justice will come to those who cheat their employees, do not pay people the money they are owed, steal from widows and neighbors, etc. Those who commit adultery and cheat one another will also face judgment. Be loyal to your God. Malachi continuously talks about covenants (marriage covenant, covenant between God and the Levites, covenant between God and the Israelites, etc. ), and being part of a covenant means you are called to be loyal to the other party in the covenant. If we are Christians, we should be loyal to God, His teachings and His church. If we are married, we should be loyal to our spouses. If we are parents, we should be loyal to our children, and children should also be loyal to their parents.